1976 John Deere 440B Cable Skidder - pictured. 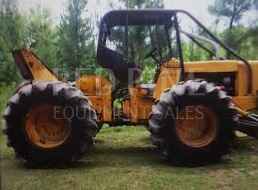 This skidder runs good, winch is strong, good main cable, 3 chokers, PowerShift transmission. Also for sale a 1976 John Deere 440A Cable Skidder with straight shift, runs good, rebuilt winch, garage kept. Contact Erik @ Red Pine Equipment 218-720-0933. Machine is located in Northcentral USA. $17,500 per machine. 1976 John Deere 540A Cable Skidder. This skidder runs and starts good, new injection pump, batteries, and starter. Has decent center section, strong hydraulics and cylinders, winch is in good working order, 18.4x34 tires, rear loaded, new ice chains on rear and new ring chains on front. Contact Erik @ Red Pine Equipment 218-720-0933. Machine is located in Northeast USA.